That’s a pithy summary of our belief that all is in God’s loving, providential, omnipotent hands, a merciful Father who will always care for us, but who also wants us to use all our strength, all our talent and all our wits to cooperate with His plan for our lives. That’s sure evident in this Archdiocese of New York. In my first year and a half as archbishop, I find myself in deep admiration of the rich faith of our 2.6 million Catholic people, who indeed pray with trust that all depends on the Lord. This prayer reaches its summit every Sunday at the Eucharist. It is nurtured by God’s Word in the Bible, by the good example and mutual support of one another in families, homes, neighborhoods, parishes and groups of friends. This prayer takes place before Our Lord’s real presence in the Eucharist, at meals or before bed, and is in union with Mary, the angels and saints. It flows from a faith we cherish and want to pass on to our children in the same effective, tender way it was handed on to us. Indeed, this archdiocese prays and worships as if all depends on God—because we know that it does. I also deeply appreciate how you all “row for shore as if it all depends on you,” as I daily marvel at your generosity, your sacrifice, your apostolic endeavors and ministries. In our priests, consecrated women and men religious, our deacons, catechists, teachers, pastoral associates, parish leaders and volunteers, and in countless parish programs, archdiocesan services, agencies, organizations, schools, nursing homes and health care centers, charitable outreach and pastoral initiatives, God’s people work hard to further the teaching, mission and salvation of Jesus in the archdiocese. Thank you for “praying hard” and “rowing hard”! I would now like to consider with you a task that will demand a lot of both praying and rowing: pastoral planning. Remember when Jesus used the parable of the farmer and the seed? The farmer works hard in clearing the field, pulling the weeds, plowing the earth and planting the seed…and then trusts patiently that, in God’s good time and under His care, the harvest will come. That’s an earthy paradigm of what I mean by pastoral planning: we have to prepare, plow, clear and plant for the future, and then trust that the Lord of the harvest will bring it to fruition. The Lord is inviting us to work together to assess needs, trends and movements in our community, and to steward carefully the use of our clergy, buildings, resources, parishes, programs and schools, so that we can keep being faithful to the mandate Jesus gave us. The great Archbishop Fulton Sheen, buried at St. Patrick’s Cathedral, once remarked that the Church is like a river. He explained that part of a river never changes, is always the same; for instance, it has water, it has banks. But, part of the river is always in transformation: the water flows, the current moves, the banks can shift. Well, Archbishop Sheen concludes, part of the Church never changes: The Deposit of Faith, the assurances of Jesus, the sacraments, the mandate to teach, serve and sanctify; but part of the Church—namely, the how and where all this is done—is always in flux. So, you and I have to plan for the future, to make sure that the river of God’s love and mercy continues to flow in the most effective way possible. Jesus is the same “yesterday, today, and tomorrow,” but His Church is always adapting to make sure it presents Him with as much vigor, joy and effectiveness as possible. In many ways the image that comes to mind is that of the vine and the branches. Jesus clearly tells us: “I am the vine, you are the branches” (John 15:5). For each of us, this is a reminder that Jesus is the center of our lives, and everything else branches out from that relationship. Jesus, as the vine, is entwined throughout our archdiocese—in our parishes, our schools, our health care, in our seminary and in our ministries of charity and justice. As planners, we realize that to sustain a vibrant, healthy growth, we must sometimes do some pruning. That pruning makes for a stronger vine and even more robust growth. Let’s face it, we’ve got some tough decisions to make in the years ahead: our people are “on the move” and populations are shifting; parishes in wonderful neighborhoods that 25 years ago were teeming with large, young families are now quiet and empty, while outlying areas cannot build churches big enough or fast enough; older parishes with extensive facilities struggle to keep them in repair as their numbers shrink, while other parishes cannot find room for meetings, education and worship; the number of priests goes down, so we have to be creative and careful in their assignments, so that all can benefit from their essential ministry; and the sluggish economy and the demands on our resources make it imperative that we take stewardship of our finances, properties and buildings very seriously. In practice, this means we must plan; we must consider building new parishes and schools, expanding and strengthening the ones we have, merging and consolidating others, and, as difficult as it might be, even closing some. At times, I am tempted to run from all of this, to avoid it, to deny that we need any planning, or that we even need to ask realistic questions and come to a clear direction with consequent tough decisions about the future. I’m tempted to say, “Forget about all this planning for the future. Let’s just keep things as they are and let nature take its course.” That is tempting; that is comfortable. That’s also irresponsible, lazy, destructive and dumb. To do so would be a betrayal of the Church’s best traditions: ever since Jesus ascended to His Father, the apostles, the saints and our grandparents have been praying and planning. They may not have called it strategic planning, but ever since this archdiocese was founded in 1808, my predecessors up through Cardinal Egan, in concert with devoted clergy, religious and God’s people, your ancestors, have been planning. They asked tough questions about opening parishes, moving and merging others, closing some, finding new priests and encouraging the faithful to take seriously their own vocations as baptized, confirmed members of the Church and collaborators in its mission. If you wonder where all this strategic planning started, take Msgr. Thomas Shelley’s excellent history of the archdiocese and see that it started 202 years ago from day one; on second thought, take the New Testament and see that it started when Jesus sent His disciples out with a primitive pastoral plan. We are called to continue the task, and find ourselves asking similar questions: Where should we open new parishes? Where should we consolidate, merge and maybe close others? Where should we challenge schools to come together in cooperation and sharing of resources? Where should we build new schools, both elementary and secondary? Where should we better assign our priests and deacons? How can our vicariates and regions work together better? Where do we need to strengthen, expand and renovate our churches, buildings and schools? What ministries are we neglecting? How can we best utilize our resources and use our finances most responsibly? For one, we acclaim the Eucharist as central to our lives, the “source and summit” of our faith, the heart of the Church. From the Last Supper, to last Sunday’s Mass at your home parish, the Eucharist defines us as God’s people. Therefore, the guiding principle in our strategic planning is that the People of God in New York need and deserve to have the Eucharist, reverently and joyfully celebrated, with full participation of all the faithful, available and accessible every Sunday and Holy Day, and as often as possible during the week. And, of course, the other six sacraments, especially baptism, penance, confirmation and matrimony, are all at the heart of our community. This primary principle—the centrality of the sacraments—will direct our decisions about assignments of clergy, and the expansion, merging and consolidation of parishes. A second principle we need as we plan for the future is the pivotal importance of the parish. Each morning first thing, I kneel down at my bed and look up at the crucifix to make my morning offering. That crucifix was made by hand by the founding pastor of my home parish in Ballwin, Missouri. I prayed before it as a child. Holy Infant parish was the channel of God’s grace, mercy and salvation for me. Without that parish, I would not be the man, priest or bishop I am today. That parish for me was a warm, embracing family, a worshipping community, where I learned to pray and know my faith at an excellent parochial school, in a community where those in need were served and where the Gospel was proclaimed as cogently as it was in Jerusalem that first Pentecost. This last happy year and a half, I’ve met thousands of you. After telling me your name, the next thing most of you immediately tell me is what parish you are from. We Catholics love our parishes; we identify ourselves with them. Thus, a second principle is to keep our parishes alive and strong. We need to plan for new ones; we need to strengthen and expand the nearly 400 we have. 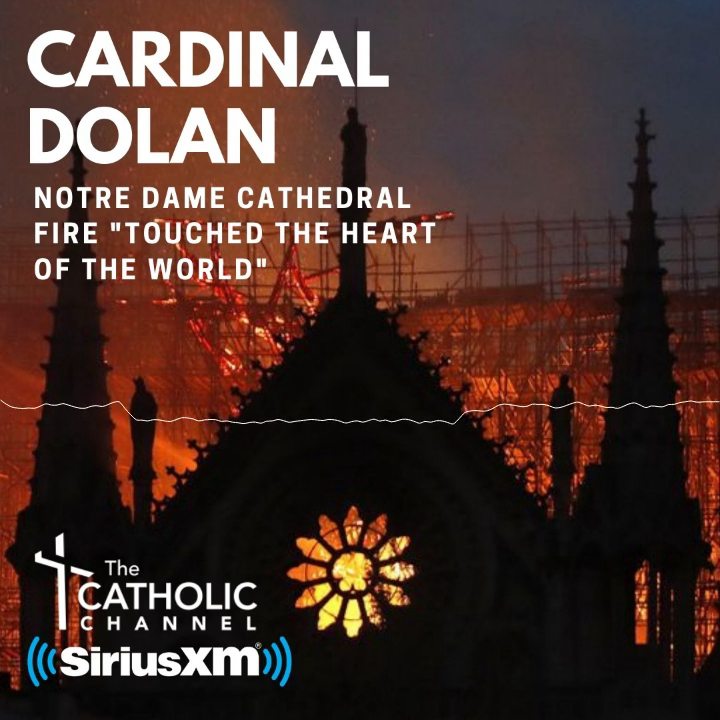 When I arrived, Cardinal Egan told me, “The heart of this archdiocese is its nearly 400 parishes.” And, painfully, we may have to merge, consolidate and even close some of the ones we have. Three, our Church and our parishes are called, not just to survive, but to serve. One of the first words Jesus addressed to His first disciples was “Come!” Indeed, as His disciples today, He asks us to “come” to know Him and love Him in the Church, in our parish, in our prayer, worship, sacraments, devotion, conversion of heart and attention to His Word. But, one of the final words Jesus uttered to His followers was “Go!” Again, He gives that same command to us now—“Go”—in love and service of others. So, the Church, our parishes, not only come to Jesus and stay there, but then go out in love and service to others. …the immigrant, historically so welcomed by the archdiocese which claims the Statue of Liberty! …our beloved Latino, Asian, Caribbean and African communities. This “servant Church” warmly welcomes and embraces all, so a corollary of this third principle is that a parish is to be a spiritual home for its people. This will be an urgent challenge for us, because, in our planning, we admit that the trend is, by necessity, toward “mega-parishes,” with large memberships and huge churches. We cannot allow our parishes to become impersonal assembly lines, because our people look to them as a warm spiritual home where they are welcomed, recognized, known and respected. Parishes are beloved anchors in our neighborhoods and communities. Finally, a fourth principle that will guide our pastoral planning is that it must be done patiently, prudently, prayerfully and with the widest consultation possible. We are not “in crisis.” We have a strong foundation and a future full of hope. So, we do not act impetuously. People have strong feelings about their parishes and schools, and we owe them a respectful hearing. People get threatened and upset if the independent existence of their parish is in question—understandably so, because they love it and are proud of it. From past experience, we know that plans of cooperation among parishes and schools work best when the process leading to it is characterized by trust, listening, extensive dialogue, constant communication and respect for all sides. No surprises. Earlier this year, I asked Bishop Dennis Sullivan to undertake in the archdiocese a new planning process. The bishop had been active in this for the last five years, beginning under the leadership of Cardinal Egan, and has invested much energy in this important endeavor. Not only that, but he knows this archdiocese, its priests, people, deacons and lay leaders very well. The bishop has begun pre-planning for this archdiocesan initiative, which will be named Making All Things New. He and a team of archdiocesan senior staff, including Msgr. Gregory Mustaciuolo, Chancellor; Msgr. Douglas Mathers, Vice Chancellor; Sister Eileen Clifford, O.P., Vice Chancellor; Mr. Frank Napolitano, Director, Office of Parish Finance; and Mrs. Eileen Mulcahy, Assistant to the Vicar General, are completing visits with each area conference of priests. Those meetings will be followed by meetings with the deacons, archdiocesan staff, religious women and men, and representatives of each parish. Each parish of the archdiocese will be asked to establish a Making All Things New committee consisting of three parishioners. A series of meetings will be conducted throughout the archdiocese with these parish representatives in order to provide them with information about the planning and to get their wisdom, insight and assistance. All of this is designed to have the widest consultation possible before we enter into the planning process for the archdiocese. There will be other elements added to this process in order to have a very inclusive circle of representatives of the archdiocese. The process will be transparent and accompanied by lots of prayer and concern for the people of God of New York. I am immensely grateful to the bishop and his colleagues for their work, which has already been going on now for nearly nine months. They do not act in a vacuum. They will depend on input from past data and from the other excellent collegial bodies in the archdiocese: the Archdiocesan Pastoral Council, the Archdiocesan Priests’ Council, the offices of the archdiocese and the Archdiocesan Finance Council. They will also be calling for consultative sessions and have already met with the clergy in each vicariate. I hope you have also heard that, after much consultation, Dr. Timothy McNiff, Archdiocesan Superintendent of Schools, has launched a strategic plan for Catholic schools, Pathways to Excellence, to strengthen our schools, increase enrollment, expand and perhaps even open schools, merge and, reluctantly, close some of our schools. This important process takes a significant step soon with intense consultation among pastors, principals, parents and parishioners in identified struggling schools, asking hard and realistic questions about their future sustainability. Every child in a school to be closed must have access to a nearby Catholic school. One, vocations. Yes, I mean “vocation” in the broad sense—that every baptized member of the Church realizes his/her gifts and duties in bringing Jesus to the world today. But I also mean “vocations” in the strict sense, that we do not weary of promoting vocations to the priesthood, diaconate and consecrated religious life (sisters, brothers and order priests). This must be a high pastoral priority for us. This archdiocese has traditionally been a seedbed for vocations, and the shrinkage of the last four decades can and is being reversed. Part of our strategic plan is intense cooperation with our neighbors, the dioceses of Brooklyn and Rockville Centre, in a common minor and major seminary for the preparation of priests. We are also conscious of the real threats to the vocation of marriage, and set as a goal the protection of marriage and the family as the foundation of civilization, indefatigable in promoting strong, faithful, loving, life-giving sacramental marriages. Two, stewardship. The people of New York are remarkably generous. We will need your continued and even expanded generosity, as we call each person to the beautiful biblical virtue of stewardship: a humble, grateful recognition that everything we have is pure gift from God, who wants us to share it generously with others. Our parishes, schools and charitable ministries struggle daily just to pay the bills and keep the lights on. To provide a secure financial foundation for the Church’s work of education and charity is a high priority in our pastoral plan and can only be accomplished through stewardship. I close by returning to the image of the boat in the water. Recall when Jesus walked on the water, and the startled St. Peter in the boat exclaimed, “Lord, if it is really you, tell me to come to you across the water.” Jesus replies with the invitation, “Come,” and, sure enough, St. Peter, with eyes focused on the Master, is able to walk on the water. So does Our Lord invite us to “walk on the water” toward Him, not letting the winds and waves of doubt, confusion and fear sink us. With careful planning, and full confidence in the Lord who promised to be with us always, we set out toward Christ. Keep praying as if all depends on God…because it does! Keep rowing as if it all depends on you, as this archdiocese has for 202 years! Keep walking on the water toward Jesus! I commend our planning efforts to St. Joseph, patron of the Church universal, and with total trust in his virgin wife and foster Son, Our Lord and Savior Jesus Christ!